Quality » John Energy Ltd.
We are committed to provide quality services to our customers. In retaining our quality standards we incessantly endeavour to out-perform ourselves in order to provide the very best services to our greatly valued customers. 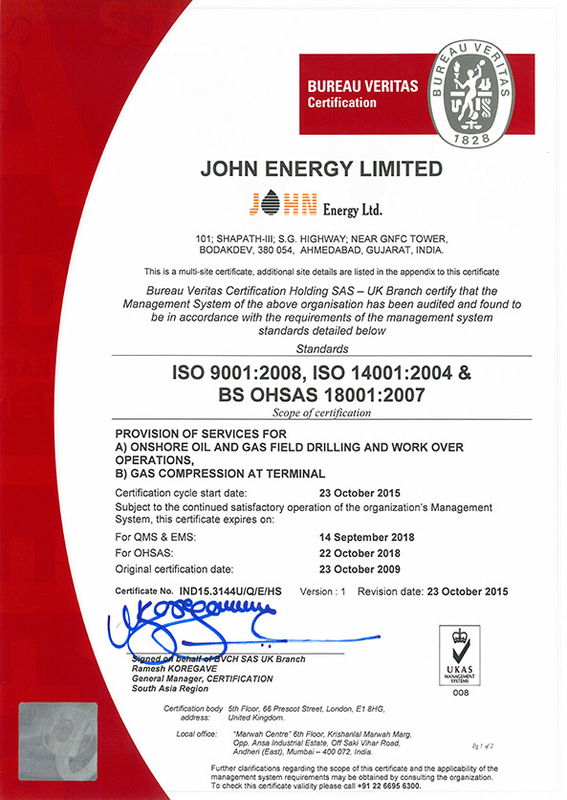 John Energy Ltd has established, implemented and maintained the requirements of Quality management system. We are an ISO 9001: 2008 Certified company for "Provision of onshore oil and gas Drilling and Work over operation services and compression of natural gas" by BVQI. Our quality policy aims at achieving the all-round and continual improvement in our performance by maximum utilization of all our resources in a cost effective manner, for the fullest satisfaction of our valued customers. The key milestones in the process are proper planning, adaptation of the new technology and up-gradation, continuous training & updating of our human resources, proper implementation of health & safety requirement, cost effective service and compliance of customer's requirement. Our Quality Management System comprises a combination of quality assurance and control system and have following components. These are continuously improved upon management review and close monitoring of the activities and processes by the management.